How to find what you're looking for fast and easy! One of our most frequent complaints has been that it is difficult for our customers to find the strains their looking for. A while back we created our twitter account to help address this issue. We’ve used the twitter account to announce whenever we deliver clones to one of our retail partners. This helped, but still it was inconvenient to use, and could be hard to find exactly the strain you were looking for; especially if you aren’t a frequent twitter user! So, with the launch of the website, we are proud to announce the introduction of clone drop alerts! Looking for specific DHN varieties? Looking for DHN drops at your favorite outlet? Or both? No problem, just check out our clone drop page. For added convenience sign up to get email alerts whenever the strain you’re looking for gets dropped! 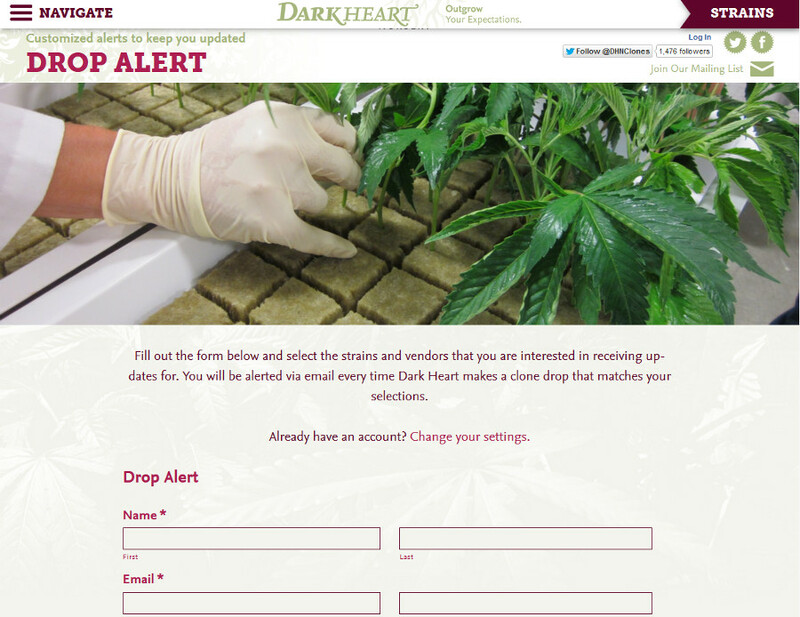 Our clone drop page (photo above) allows you to search by strain and retail partner. So if you’re looking for a specific variety or want to know what your local dispensary had delivered this week, you can look it up quickly. On the right side of the clone drop page you will find check boxes that allow you to filter drops by strain and location. After clicking “filter drops” you will be shown matching drop notifications on the left side of the page. In addition to the clone drop page you will also find drop information on our strain pages and retail partner page. On every strain detail page you will find a section which shows where that strain was last dropped. By clicking the left and right arrows you can browse between older and more recent drops of that strain. The retail partner page displays the most recent drops for each retailer. Just like the strain page, you can browse drops using the left and right arrows. In addition to these new features, drop alerts will continue to go out on twitter, but for the most timely updates, consider subscribing to email alerts! Email alerts ensure that you will receive the most up-to-date information about when we are delivering the strains you want at the dispensaries you care about! To subscribe to email alerts look for the “Keep Me Updated” icon throughout the site. Look for this icon to subscribe to drop alerts. Clicking on this link will take you to our Drop Alerts form. You will need to create an account to customize and manage drop alerts. To do so, fill out the information fields then select your drop preferences. Any time a drop happens that matches your selected preferences, an email notification will be sent to the email address provided. Should you want to change your drop preferences, use the “Change Alert Settings” link located in the footer at the bottom of any page. You will be asked to login to your account. You can unsubscribe from email alerts from the “Change Alert Settings” page or by clicking the “unsubscribe” link in the drop alert email itself. We sincerely hope that these features will help our customers find exactly the strains they’re looking for in the most convenient fashion possible! We hope you will get in touch and let us know how it works for you. Use this page to subscribe to email alerts for your favorite strains!